I was 23 months old on November 22, 1963 and about 30 miles away from the exact location where the thirty-fifth President of the United States was murdered that day. Of course, I have no personal recollection of the assassination, but in a way this horrific act helped shape my childhood and life. JFK was my childhood hero…is still my hero. My entire life I wanted to establish a link to him….to reach out and touch something that he touched during his lifetime. One day in 1992 I saw this picture and instantly knew what I had to do. 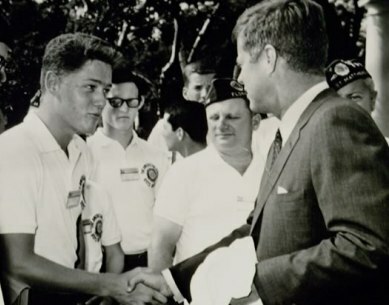 William Jefferson Clinton visited the White House on July 24, 1963 as a member of Boys Nation. The 35th President of the United States reached out and firmly grabbed the hand of the 42nd, and a historical photograph was snapped. Clinton was campaigning for re-election in 1996 and had a scheduled stop in downtown Fort Worth. I went down to the appointed spot 5 hours early, got myself front row center of the stage and waited. The President arrived with Ann Richards and other notable Democrats in Texas. It was thrilling to see everyone and to listen to Clinton rally the fateful. I gave my camera to the total stranger next to me and told him to snap my picture with the President because I just knew we were going to shake hands and I would have my link to JFK. After his stump speech, Clinton made a bee-line to the front row and was walking directly to me! I looked at the guy and he had my camera ready to go! The President grabbed my hand with his right and draped his left hand over the top. We had a brief conversation and I could hear the click of my camera. It was 1996 so I had to take the film cartridge to the drug store for processing. Two days later the prints were picked up and I nervously ripped the envelope open. Inside the envelope I found six pictures of the side of my head??!!! Not one photograph of the handshake between me and 42!! What an idiot!! How did this happen?? He was a stranger, I couldn’t even track him down to strangle him!! How long did I have to wait before I got another chance at Clinton? 2008. Yes, twelve years later Bill Clinton was traveling through the DFW area stumping for Hillary and her historic presidential campaign. One of his stops was in a field in Grapevine, Texas. Like a dozen years before I showed up about 4 hours early and stood in 35 degree weather in a dirt field behind a civic center. Where else in America would this happen? The motorcade pulled up on time and secret service exited with Clinton who jumped into the bed of a pick-up truck to give his speech. His speech that day was unbelievable and the 200 or so people gathered were yelling and cheering for him…and Hillary. During his speech, Clinton looked directly down at me several times. Did I have a professional photographer with me you ask? No. Did I at least bring a friend to secure a good photograph this time? Again, no. It was in the middle of a work day and self-employment was the only reason I was able to attend. I once again looked to the stranger next to me and asked her to snap a photo of the President shaking my hand. “How do you know he is going to shake your hand?” she asked. Just trust me, I told her….he is going to finish his speech and walk right over to me. …and that, he did indeed do. President Clinton walked up to me and I told him my name and quickly rattled off a question about the media bias I thought was evident and favoring Barack Obama. I couldn’t tell you a thing about his response except the first two words he uttered, “Well Julya.” I’m sure it was a mighty fine answer, it was just that he put both his hands on my shoulders and looked directly into my eyes! My response was not Monica-esque, but what they say about the man is correct. The entire outside world disappears for him and it appears that you and your question are the ONLY things that matter to him. My full circle moment was complete the next day as I printed off the picture at the camera store by my house. I laughed out loud when I saw it and realized I had learned nothing in the past 12 years!! At least this time I have proof that the encounter truly happened and not just a picture of my thick head of hair! It is actually a very good shot of the secret service guy though, don’t you think? 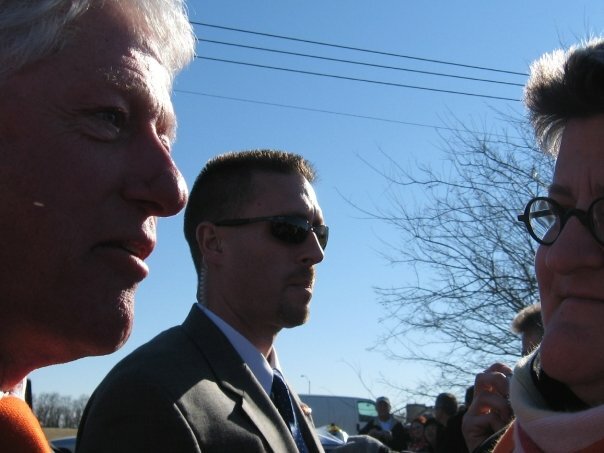 JFK shook Bill Clinton’s hand….and I had shaken Clinton’s hand, now twice. In the weird world that exists in my brain, that was my connection to my childhood hero, I was happy. The picture doesn’t show the actual handshake, that is true, but I am hoping for another chance…maybe in 2016?